Stylized black-and-white portraits are prominently displayed on the monitors throughout the sold-out lower Manhattan venue SOBs. One audience member remarks on the striking similarity between the images and Khalid, the teenage R&B star-to-be, the night’s headliner. Young, handsome, and oftentimes serious-looking, Khalid is just barely a year into his career, but his image is already instantly recognizable—just look for silhouette of his flattop. As the crowd waits for the singer to come out, a voice recording starts playing over the speakers. The lights dim, and Khalid’s voice details dramatic shifts that have taken place in his life over the last year. He explains frequently traveling while growing up and eventually—against his wishes—settling out in El Paso, Texas, where he was plucked from his old friends and knew no one. Khalid says he felt like an outsider at school and chose music as his outlet instead. The overwrought backstory recalls Bryson Tiller, another RCA Records signee, who relishes in detailing his rise from selling pizzas to selling out shows. Both artists know their origin myths well—but perhaps, they are unnecessary. Without them, the music would still sound just as good. Backstory or not, when they finally come out, Khalid and his finely-tuned backing band perform with such swagger that you might forget this teen was once recording mopey SoundCloud demos. Onstage, every exaggerated shimmy, shake, and sway shows Khalid is ready for—if not already used to—the stage. He opens with “Let’s Go” and “Reasons,” which, in their recorded versions, are fairly stripped down R&B tracks—but live, his band swells with intensity. The scrappiness of the songs is lost as Khalid sings wonderfully and his guitarist, keyboardist, and drummer exceed his energy at some points. The professionalism is almost jarring for a teenager’s first full tour. Halfway through his set, Khalid plays a few newer tracks—presumably from his upcoming March debut album. Stylistically, these songs are far funkier and more joyful than his early material. The bedroom quiet-storm quality of his older music is shed for more straightforward pop funk. The transition is reminiscent of artists like Neon Indian, Toro Y Moi, and Twin Shadow, who all started making bedroom pop and eventually took center stage with a bigger and fuller sound. Except those transitions took years. 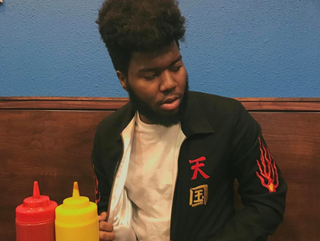 Khalid’s musical transformation has been happening over the course of a few months, while his breakout song “Location” has been climbing the Billboard charts. It is clear, too, that the crowd isn’t just there to hear the hits; they start yelling lyrics whenever Khalid’s mouth reaches the microphone. If Khalid is a natural at performing, he is still getting used to interacting with the crowd. The audience’s intensity pushes out a few chuckles and smiles. Khalid is clearly marveling at his own fame reflected back at him. The night’s penultimate song is also his biggest: “Location,” a sultry, social media-obsessed love song with an almost too on-the-nose millennial line (“I don’t wanna fall in love off of subtweets”). Khalid, after one verse, pulls back from the microphone to allow the crowd to carry the song, which they do, right on cue. All of his lyrics are repeated back to him, but when Khalid regains control of the song and the audience fixes their gaze back on him, it’s clear why he is the one onstage. Before he took the stage, an interesting playlist sounded through SOBs, covering trap (Gucci Mane, Migos), ‘90s throwbacks (Bell Biv Devoe, Michael Jackson), and even a touch of contemporary Top 40 pop with Bruno Mars’ “24K Gold.” But what stood out the most was a string of R&B singles from the early 2000s, like Usher’s “Confessions,” R. Kelly’s “Ignition (Remix),” and Pharrell’s “Frontin’”. Proto-throwback jams for the inevitable 2000s nostalgia wave, the songs are a reminder of a time when R&B occupied a real space in American Top 40 radio, before radio began to favor EDM-influenced pop. The songs came on right before Khalid’s set, and felt like a small tip-off to the real direction of his music. He may be a R&B singer—what else is a black guy who sings about love—but he’s primed for pop stardom.